It’s been almost two weeks since Hurricane Sandy battered New York and New Jersey. The waters have receded, and the power is back (in some cases), but the work is only just beginning. Neighbors are helping neighbors, and communities are coming together to help those in need. The Asian American community is no exception. Here is a short list of a few organizations and individuals who are making a difference. Located in Chinatown, the Committee Against Anti-Asian Violence (CAAAV) has spearheaded relief efforts for low-income Asian immigrants and other residents of Lower Manhattan who have been overlooked. 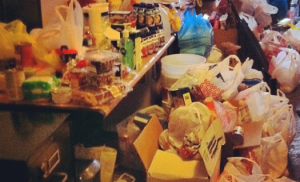 CAAAV has rallied volunteers and collected donations since Hurricane Sandy hit. Click here for a list of donations and how you can help. The Asian networking site AsianInNY has been actively posting information concerning all aspects of post-Sandy news, from gas rationing to transportation issues. They are posting often about relief and recovery efforts, urging people to get involved. The group is also encouraging people to dine out in hard-hit areas to show support for local restaurants. JAUC is holding a Thanksgiving dinner on Sunday, November 18 following its 11:00 a.m. worship service. The $8 suggested donation for the dinner will be used for victims of Hurricane Sandy. RSVP by Wednesday, November 14 to infojauc.gmail.com or call 212.242.9444. Many individuals in the Asian American community are getting the word out about fundraising or are doing the fundraising themselves. The following people are members of JAJA, an informal group that brings together members of New York’s Japanese community. Mezzo-soprano Yumi Thomas has also launched a grassroots relief effort of her own. Thomas has set up a PayPal account through which she is collecting donations that she will use to purchase supplies such as blankets, flashlights, food, and water. Thomas will personally distribute these items to communities in need this weekend. To donate, go to PayPal.com, create an account (if you don’t already have one), select “Send Money,” donate to yumi.thomas@gmail.com, select “Personal,” select “Gift,” and enter the amount. We’ve talked about what you can do to help, but if you’re the one in need of assistance, Asian American Arts Alliance (a4) has an extensive list of Hurricane Sandy recovery resources. Many of the agencies are geared toward helping artists, art groups, small business, and members of the Asian American community. Notable organizations on the list include Asian Americans for Equality (AAFE), Asian American Federation, and Korean American Community Foundation (KACF). There are many more individuals and organizations making a difference in this time of need. If you know of someone who should be highlighted, e-mail susan@japanculture-nyc.com. Next Next post: Book Review – "Fine Bonsai: Art and Nature"